The award-winning WITec RISE microscopy mode for correlative Raman-SEM imaging is now compatible with the scanning electron microscope ZEISS MERLIN. The new hybrid system was jointly developed by the two German microscope manufacturers, bringing together a wealth of expertise in Raman spectroscopic imaging and advanced ultrastructural analysis. Customers benefit from both high-quality and sophisticated system components for state-of-the-art research in the fields of nanotechnology, life sciences, geosciences, pharmaceutics, materials research and others. The first system of this kind is currently being installed at one of the largest research institutions in South Korea. Correlative microscopy involves using two or more microscopy techniques. RISE correlative microscopy combines a confocal Raman Imaging and a Scanning Electron (= RISE) microscope in a single system. Raman microscopy, as a label-free, non-destructive technology for the identification and imaging of the molecular composition of a sample, is the perfect complement to SEM (scanning electron microscopy), which visualizes the surface structure of a sample, and the often-associated EDX (energy-dispersive X-ray spectroscopy) that can only identify elemental constituents. The integration of both techniques into one system greatly improves ease-of-use and accelerates the experimental workflow. It places both the objective and sample stage required for Raman microscopy within the SEM’s vacuum chamber. Thus the sample can remain under vacuum for both measurements and is simply transferred between the Raman and SEM measuring positions by a software-driven push-button mechanism using an extremely precise scan stage. The first RISE pictures with the WITec-ZEISS combination were obtained from the interior of a lithium-ion battery and demonstrate the full capability of this hybrid instrument (Fig. 1). "We look forward to our collaboration with ZEISS on the new RISE combination advancing the use and utility of Raman imaging in the SEM community”, says Philippe Ayasse, Business Developer for RISE microscopy. 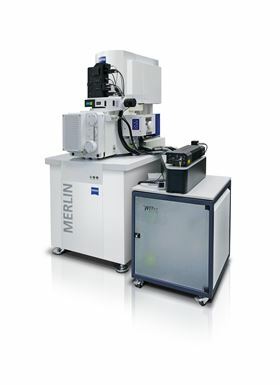 The combined system provides all functions and features of a stand-alone ZEISS SEM and a WITec confocal Raman microscope (Fig. 2). Both SEM and Raman imaging are high-resolution imaging techniques. In Raman imaging mode the sample can be scanned through a range of 250 x 250 x 250 µm3. The microscope enables software-driven quick and convenient switching between Raman imaging and SEM, transformation of the Raman spectra into an image, and the ability to overlay both images to produce the RISE image. RISE microscopy pairs ease-of-use with exceptional analytical power and is therefore suited to a wide variety of applications such as nanotechnology, materials science and life science.